While the agonies of a too-long and too-bitter campaign were drawing to a happy — for a winning percentage of us at least — conclusion, another milestone slipped by: the 50th anniversary of the death of Eleanor Roosevelt. The great writer/ speaker/ activist and long-suffering (though few knew at the time) wife of New Deal President Franklin D. Roosevelt died on November 7, 1962. She and FDR moved into the White House a few months before I was born. When she moved out after his death nearly a dozen years later, she never skipped a beat in her own career of promoting justice for all. I remain a fan. It’s heartening to find she has new generations of fans, including adventure/travel blogger Lesley Carter, who runs this ER quote across several pages: “The purpose of life, after all, is to live it, to taste experience to the utmost, to reach out eagerly and without fear for newer and richer experiences.” Eleanor’s experiences, which included riding elephants in India and exploring the mysteries of Africa, Asia and beyond, nearly always highlighted her passion for promoting peace and justice at home and abroad. At the time I met her, global peace seemed a far more attainable goal than it does today. It was the fall of 1953. I had just turned 20, graduated from college, settled happily into an apartment in downtown Richmond, VA with my sister Mimi and college roommate Pat, and landed my first full-time job with a local public relations firm. Mimi was dating a dashing young reporter for radio station WRNL named Roger Mudd; I was dating a dashing young political cartoonist for the Richmond Times-Dispatch named Hugh Haynie. The world was our oyster. 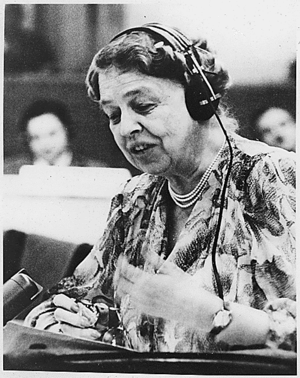 My PR firm had landed the job of arranging for Mrs. Roosevelt’s speech in observance of United Nations Day, an event planned for Richmond’s Mosque Theater and made somewhat controversial by the fact that it would be open to anyone – since she did not speak to segregated audiences. This, among other things Rooseveltian, did not sit well with James Kilpatrick, the arch-conservative segregationist editor of the afternoon newspaper, The Richmond News Leader. I snagged the plum assignment of meeting Mrs. Roosevelt at the Richmond Airport, which at the time consisted of a Quonset hut beside several runways, out in Henrico County farm country. There were several of us in the delegation; it did not hurt that my father was then chairman of the Virginia United Nations Association. In the time it took Mrs. Roosevelt to travel from New York for the one-night visit, Kilpatrick had published a vitriolic editorial, condemning just about everything she stood for beyond motherhood and apple pie. We took a copy of the paper to the airport so she could read it on the way into town, since there would only be a few minutes to spare between her arrival at the hotel and the press conference scheduled just before dinner and the event. I remember being introduced to her, and subsequently being called by name every time she spoke to me, a small but extraordinary gift I think she conferred on everyone she met. We had seen a draft outline of Mrs. Roosevelt’s speech. It was all about international friendship and cooperation, the importance of education, global health needs – essentially the same issues she would probably be addressing today. How, I wondered, would she possibly get to her significant national/international subjects in light of the unavoidable local hostility? The press conference was barely underway when hands went up all over the room, and questions were shouted, asking for a response to the News Leader editorial. She smiled broadly at the writers and reporters who packed the room.“I understand,” Mrs. Roosevelt said, “that your new editor is very bright, very talented – and very young.” She paused. “Over the years, I have learned to have great patience with youth.” Then she smiled again and took the next question. Ah, so. But Mrs. Roosevelt, I suspect, would approve of the youthful President just re-elected to the job her husband held eight decades ago.